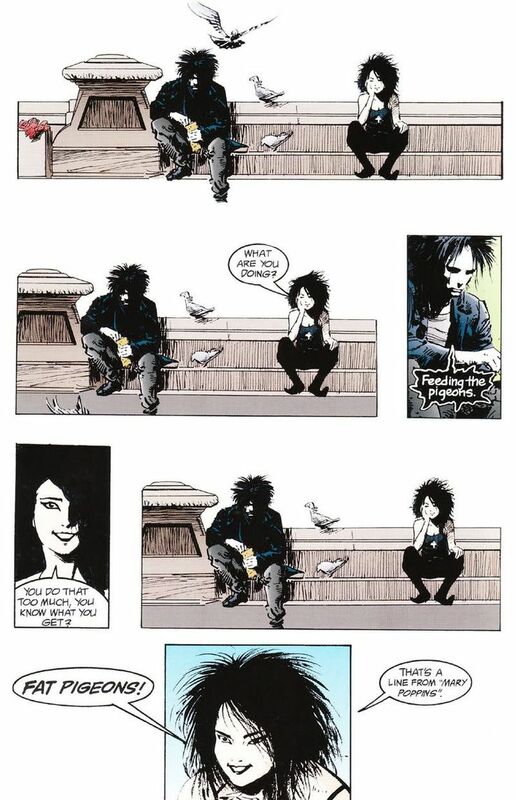 Welcome to the final readthrough of the first volume of The Sandman by Neil Gaiman. We’re in the setting of some kind of place….not sure what to call it though. A park? It has a famous constructed figure behind it. You know what I mean if you read the comic (off to a great start here…) Sandman is feeding the pigeons, some teens are playing soccer, then the ball is about to hit him but he stops it with his hands. A guy comes up takes his ball impressed by Dream’s skills. Then a teenage girl comes up, sits beside Morpheus. It’s his sister, Death. They talk. Dream basically recaps the entire story arc for his sister and tells her he feels like nothing because he got his revenge on his capturers, but it wasn’t satisfying. Death tells Dream to stop being stupid and to get a new purpose in life. They start to walk around the city. Death and Dream walk into different places to see deaths of different people. Basically Death can easily witness deaths and both characters act like it’s nothing. Some deaths are really sad and heartbreaking. At the end of the day the guy who accidentally kicked the ball at Sandman gets run over by a car. The soul of the guy walks up to Death and Dream says goodbye to her. Morpheus walks around and throws his dust in the air proclaiming that restoring his Dreamworld will have to wait and that he has a different plan for himself. I really loved the calming pace of the issue. It was so fun to follow and meeting Death was really cool. This issue was a nice closing chapter for this volume basically serving as an epilogue. This entire arc felt like a small prelude for what is to come for the rest of the series. I cannot wait to continue reading it. You can buy next issue #9 or Volume 2: The Doll’s House. This might be my last Readthrough I am doing for the series as I just wanna binge-read the entire comic line, but the pace of this slows me down. Unless anyone wants me to continue I hope I was able to convince you to read The Sandman for yourself. I think it will get better and better so pick it up. Make sure to read ComicBooger for Marvel vs. DC battles, Top Comic Stories of the Week, and other huge comic book content. See ya!